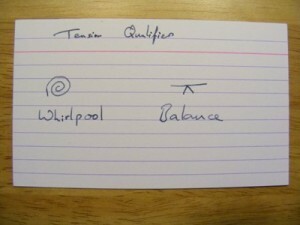 A few years ago I went on a leadership course. It was a strange and challenging experience that certainly altered my view on life and people forever. It consisted of a number of lectures and team-building exercises (with a bunch of strangers). It was not the sort of course where you get a handy ring binder at the end; no-one took notes when the lectures were delivered. Even so I can remember the content of most of them, which is pretty remarkable retention. 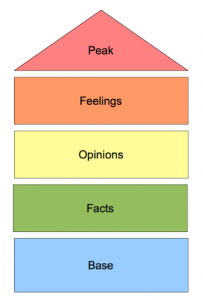 The number one concept that remains is the idea of tiers of communication. I don’t think I’ve seen this anywhere else (so if a reader can identify the theory, I’d be grateful). Base is the bare minimum of communication you must do to get by. Facts are irrefutable observations. Once you go into the realm of Opinions you start to risk offending someone by talking to them. Showing them Feelings exposes you to even greater risk–but at the same time there is a better overall understanding. It all comes together in Peak communication, the optimum and complete form. I like models, and this is one of the most useful I’ve encountered. It’s easy to observe and test. Colleagues who only communicate with smalltalk can become wrong-footed when you suddenly move to expressing opinions. The main example we got was greeting someone with “how are you?” and being answered with a cheery “fine!” despite the fact they were limping. Once you move to “actually, I’m in a lot of pain” you’ve automatically moved into an uncomfortable space of statement of fact (or even feelings). You’ve put a foot on the communication ladder. I’ve been suffering with the misery of sciatica for two weeks now. This is why it’s 4am and I’m standing up to write a blog post waiting for the painkillers to start working, when I should be asleep. So when colleagues ask me “how are you?” I reply honestly. It’s clear they didn’t want to know; they’d rather get away. I tend to let them off pretty quickly by changing the subject. I know he’s a Christian, but even so–he’s taken more risk than I did in that conversation by leaping into the realm of Opinion (and if he was sincere, Feeling) about his personal religion. I don’t have much more to say about that. I guess I could talk about how in gaming we should strive towards peak communication between characters by taking risks, stating Opinions and displaying Feelings of our characters. But, the main thing I’m thinking about now is how deeply those statements intrude into the thoughts of others, particularly a secular heathen like myself. I also think about how much less they would matter if spoken in a Christian community, where prayer is taken for granted. In that context, they’re a statement of Fact. But they’re still an expression of Feeling, maybe even Peak communication. As people become more alike, do you go up the scale or down? The best combat system I ever played with (even better than Lace and Steel) was also one of the simplest. 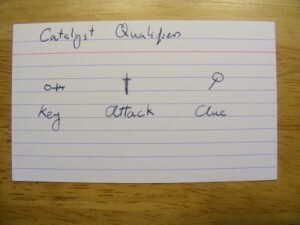 It was a homebrew system for a fantasy game, and followed this basic mechanic. You had two combat stats. One was your “combat skill”, which was a general ability at fighting. The other was your “weapon skill”, which was your specific technique at attacking and parrying with a given weapon. It worked like this: when two opponents engaged, they rolled Combat Skill. The winner had “control” of combat. They could choose to directly attack the other side, or hold off and “set” their attack for the next round. The loser could only defend, and hope they survived long enough to win control next round. The act of “setting” meant that the follow-up attack would be much more powerful than a no-set attack. However, to make it work you had to win combat for the new round. If you didn’t and the opponent got control of combat, you lose your advantage. 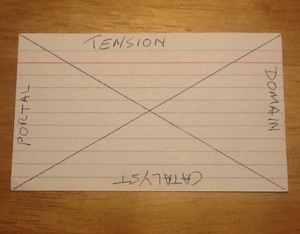 It was incredibly simple, and yet made for superb tension and gratifying victory. If characters were evenly matched it meant they took a lot of sniping attacks to wear each other down, not wanting to risk their window of opportunity. If there was a gross mismatch one side would tend to “set” once and deliver a rapid kill. In the mismatched case, that lead to a couple of other consequences. There were no (or very few) one-round victories, meaning such combats took at least two “beats”. The first beat foreshadowed the second–the victory to come. For fights where the PCs were clearly superior, this was blatant player gratification. They saw the victory, anticipated it and savoured it. That sounds a bit lurid, but it’s what happened. When the shoe was on the other foot and a PC was in danger, it telegraphed the impending doom. This happened to my first character. He was a monk with a stick, and he squared off against a knight to protect a weaker PC. GM: Xiao’s fencing with the knight. Another Player: We’ve not seen him fight before. How’s he doing? GM: He has good technique but he’s hopelessly outclassed. He’s going to die next round. The system allowed that exchange to happen–another character (with way more combat experience) watched the fight, stepped in and saved Xiao. From my perspective it was transparent that Xiao was going to die–it really was hopeless. When the other PC stepped in it was gratifying for me (being rescued) and them (being the rescuer), and made for interesting roleplaying later. Had we been playing Runequest it may have been different. Xiao squares off against the knight and before anyone can even react, he takes a fatal blow. That still has merit for a game, but it sets a totally different tone. Using this system, Xiao’s life hangs in the balance for a moment, and in that moment another character can act. Combat Skill functions a bit like Initiative, but it’s not the same. Most Initiative systems just give the order of action, and do not preclude one side from attacking the other (unless the systems are so deadly that instant kills are common). The only system I’ve played that plays like the one above is Lace and Steel, where the initiative is passed between the two fencers. “Combat Skill” is not a micro-scale activity; it encompasses a whole range of assumed activities the Martial Artist is doing. Hope would term this the half-pursuit; a series of testing actions designed to both get the measure of the enemy’s fight, and herd them into a predictable pattern of activity against which the artist can employ a strategy. The whole point of winning control of combat is to gain “the place”, which is the correct distance where you can launch your desired attack. If you don’t have “the place” and you attempt to launch an attack it will fail–you may be too far away, or “disordered” and at risk of a counter, etc. Combat skill happens in the minds of the combatants. It includes decisions, actions, strategies, the will to press forward, the ability to anticipate an opponent’s action and counter. It is everything that happens before the attack roll is made. What does Weapon Skill represent? It represents technique, strength, accuracy, muscle memory, attack and parry. It’s everything that happens once one side gains the place. It is attack and parry. It is possible to gain the place and miss; it is possible to defend against an attack launched from the place. To successfully implement this idea, you have to win the hearts and minds of the players. They have to both enjoy the system and get the theory behind it. So I’m going to anticipate a few stumbling blocks. 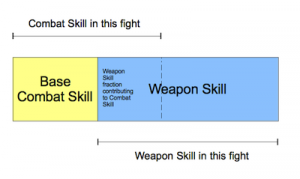 Players won’t initially get how Combat Skill and Weapon Skill relate to each other–or the fact they don’t relate to each other. That’s not what we’re used to, and a source of frustration for character generation. That’s really down to the GM and designer. Traditional games like RuneQuest accept a strong competency in one weapon and zero ability in another that should be quite similar (say an axe and a mace). There’s no argument, it’s just the way things are in that system. Combat Skill is a leveller. It means that even when outclassed by superior weapons, a more experienced fighter can still control the combat. They may not be able to do anything useful (see the next problem) but they can at least keep themselves relatively safe, for now. I don’t like this way because it makes things more complicated–you have to add and subtract–but if that’s what you and your players want, you can do this. You can then “tune” the system to be closer to D&D (i.e. your fighter is capable, regarless of weapon) or RQ (competency is strongly biased per-weapon). I prefer to tackle this problem in a completely diffrent way–be completely up front with the players, run them through a few combats, manage expectations in character creation, and don’t touch the Combat Skill. It also won’t make sense that, no matter how badly mismatched weapons are, the winner of the Combat Skill roll will always get to do something and the loser only gets to defend. To borrow some of Apocalypse World’s parlance, winning the Combat Skill contest gives the artist the chance to “make a move”1. That move is usually just a straight attack, but could be a subduing action, taunt, wrestling, or even fleeing. It’s easy to deal with the mismatched weapons. Consider a heirarchy of weapons; if you intend to press in against a greater threat (say, a weapon with better reach, or unarmed vs armed) and you fail, you are instantly vulnerable to a counter. If the opponent manages to defend they automatically get control of combat next round. Of course if they’re relatively green they might not keep control, but it gives them an attack of opportunity. Attacker is in the first column; cross reference with the top row (the defender). Fleeing is a special case. Regardless of who has control over the combat, people should be able to flee if they want to. I haven’t even started to think about changing weapon distances, e.g. what happens if the dagger-man gets inside the point of the spear-man. I think the way to do it is a new table for the new distance (the above assumes “open fight”) and some of the “moves” you can apply are designed to change the engagement distance. But I’m already talking about crunch, when I wanted to address principles. Let’s park this for now. How does the system adapt to changing environment? An armed skirmish is not a formal duel, which is not a brawl in a cellar. You have a few levers you can pull. One, you change the character’s Combat Skill. Maybe they’re in unfamiliar territory. Maybe they’re surprised. Somehow their Judgement is compromised. Two, you can change their Weapon Skill. This is appropriate when, say, the weapon is just too big for the environment. Three, you restrict the Moves they can do from The Place. That’s not a lot different from just restricting their Weapon Skill, so mostly down to taste; however there may be a couple of cases where you want to shut down what moves your players can do, e.g. if they’re somehow backed into a corner or otherwise restricted. How do you deal with multiple opponents? This isn’t hard to do, but requires a conceptual leap. 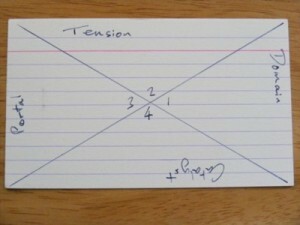 Most systems assume that your opponents will pack in on all sides and will all take swings. Some deal with multiple opponents by forcing you to divide attack or parry percentages. The assumption is that all opponents attack at the same time, in the same space. That isn’t how a many-on-one fight works, usually. One opponent will always be closer than the other, and you can assume the lone fighter is trying to keep it that way by moving so one of their opponents is between them and the other one. If they can keep that up, one of their opponents will never be in a position to land a blow. They then only have one opponent to deal with. Job done, eh? Well, not quite. If our lone fighter wants to hit one of their opponents, they have to commit to stepping into distance for their attack. As they do that, the other soldier–the one they’re trying to keep away–also steps. Mechanically this works like mismatched weapons, i.e. if you attack one opponent and screw it up, you’re immediately asking for a counterattack in the next round, and may need to go on the defensive. As long as you have control of combat, you can keep the two (or three, or four) bad guys at bay. How you measure “control” needs to be defined, of course. 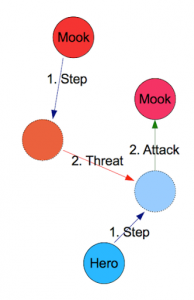 Do you treat the attacking force as a single entity (i.e. one opposed roll), or does each participant roll separately? If they roll separately and your hero has a higher score than some but lower than other opponents, how do you handle that–do they get a free attack anyway? Do they have to beat everyone before they can pick a target? Other considerations might be the fatiguing effect of fighting more than one person–does fatigue exist in this system? Does it affect Judgement/Combat Skill? To further separate the Combat Skill roll phase (“initiative”) from Weapon Skill (attack/parry) you could make them use different dice. A friend’s system (which is a couple of decades old) uses a d6 dice pool for attack, looking for matches, but the parries are made using a percentile roll. It feels a bit funky, but it works (variable success result for attack, binary result for parry). If you want to make the Combat Skill roll more meaningful than a simple yes/no threshold, adding a dice pool mechanic might make for some interesting mechanics. (I have some ideas, but I’ll save those for later). This could make it nicely distinct compared to your (percentile? opposed single die roll?) attack/parry roll that follows afterwards. A game like Runequest could be perfect for adding a “Combat Skill” layer on top of normal fighting proficiency. It would need some effort to incorporate other aspects–spell casting, missile combat, and so forth, but it could be done. RQ is surprisingly easy to tinker with, and combining an extra “Combat Skill” as part of the Basic Skills package isn’t hard. p>Well, clearly it matters to me since I wrote this. Does making the system more “real” fill a niche in the gaming market? Only insofar as it gives you a marketing lever. D&D, RuneQuest and others have been satisfying gamers with their mechanics for decades. If you can’t explain why your system follows martial principles then it has no value over established systems (which fill the primary need of being a game). Besides, realism is an illusion. If players are getting the immersion and the thrill they want, the system already works. I don’t feel this system is an answer to anything, other than scratching a personal itch. However I do think it’s possible to develop a system that’s true to martial principles I agree with, but simple enough that anyone can enjoy it. Maybe more later. Yes, I know AW explicitly avoids double moves. What game systems do you think do the best job of simulating pain, as well as the fear of pain? p>There were a few replies around systems that deal with pain as a consequence and penalty to action, but there’s not much that deals with fear (and specifically fear of pain) as a factor that would stop you to act. There are good reasons for this. For one, RPGs are a fantasy; unless you want a game where the horror is presented to PCs as their inability to act in the face of injustice (an example was being too afraid to interrupt a mugging) it’s best to leave those choices to the player in charge–they should be able to imagine their PC’s fear and they will certainly know the consequences of failure if their unarmed hero takes on someone with a knife and it goes south. There are disadvantages you can take (in GURPS) that deal with an inability to act in stress situations, but these are not imposed system-wide. So I was thinking about how to simulate this and keep the system workable and fun. The best way I can think of is to make it fear of escalation: that is, your PC is fine with getting into a brawl where the worst anyone will suffer is bruises, but outside her comfort zone once a lethal weapon is drawn. Another example which is slightly backwards is a society of effete nobles who are fine stabbing each other to death with rapiers, but actual brawling and getting a bloody nose puts them outside their comfort zones. 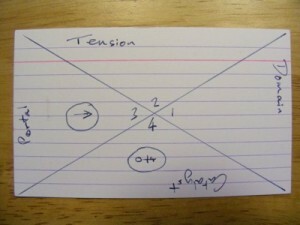 It would be possible to design a game with “partitioned combat” that requires effort to transition between types of combat. That effort would be more or less depending on where you were from, whether you’d killed before and your general attitude to life, fear of punishment for crime, etc. I know Dogs in the Vineyard escalates conflict in this way, and when I’ve had the system described by someone who doesn’t grok it, their response is “but why don’t I just leap all the way to guns drawn and kill them?” I don’t think the DitV approach fits most systems, because it doesn’t really answer this question. But I think it’s a good start. This “partitioning” is probably useful for NPCs to determine how far they would go in a given situation to challenge the PCs. For PCs, it’s probably best to leave to player choice. This is a roleplaying game, after all. Players will respond to consequences rather than threat when deciding whether to engage. If you want them to really think about whether they want to escalate the fight from fists to knives, make the consequences really bad. The example of interrupting a mugging–assume the NPC has already escalated by threatening a PC or dependent. That would and should override fear of engagement (unless the PC had a stated disadvantage). I’ve been that person, but I’ve been on the receiving end often enough that I try to respect the GM’s handouts. It’s only been a real problem when said miscreant has thrown a fit in the game because they don’t understand. It’s a very human response–games with any kind of competitive leaning are designed to be stressful. But it’s also disruptive. But… what if I did refuse to explain anything? Just ignore any protests, requests for clarification, and so on. Give them a character sheet that is deliberately arcane, with confusing or contradictory information. Since I’m treating all players equally, no-one gets singled out or made to feel stupid. It could work. Or I could get lynched. My provisional title is What? I also get this at work, where I have less patience, but am forced to have better manners. My respect for LOTFP grows. D&D already telegraphs player strengths through the class system, and LOTFP leverages this beautifully while adding its own tweaks. This is the first instalment of a series that considers a new tool: the City Accelerator. At some point there may be a game that uses this tool directly. But for now, the intention is to have a tool that can be applied to any and every game. Well, any game I care to run anyway. The City Accelerator frees the GM of distractions when designing a city or other cluster of locations. The tool enables her to maximise impact of her locations in terms of plot, and enables the players to properly visualise the locations they visit. Where applicable the tool also assists in exposing locations to the players at the correct time–such as when they have achieved certain goals or attained sufficient power. p>Who needs this tool? No one. We’ve been getting along fine for decades with our maps, topological diagrams, or bullet points scribbled on the backs of envelopes. Hindsight is a wonderful thing, though. The Dreadful Secrets game contains so many locations and people that both GM and players can be overwhelmed. If I were to run it again, what process would I use to make the setting presentable? After some thought, the answer is the workflow I’m going to discuss shortly. This approach is designed to work for both new content, and existing modules. For generating new content the idea is to free the GM of distractions such as mapping or irrelevant locations. 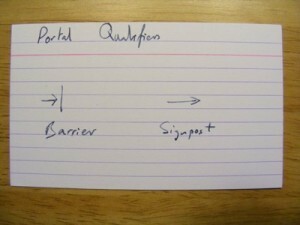 For parsing existing material (i.e. a commercial product) it should help the GM lay out the arena so it’s presentable to both them and to the players. In both cases the operative word is accelerate: the tool should make preparation faster and easier, as well as boost play. 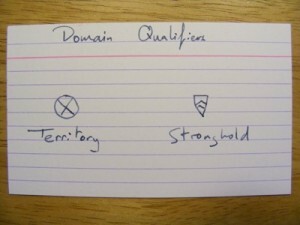 As I’ve written before, I’m keen on cognitive maps and visualisation tools, and how they can be applied to the hobby. 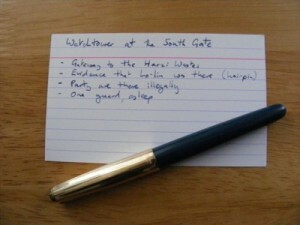 For this tool I’ve chosen index cards as a medium to work from–they’re cheap, flexible, and tactile. Post-its and scraps of paper will also work. That’s it for now. When the series is complete I may bind it up into a pdf, or something. The next instalment will focus on what makes a viable location. The Zeppo pushes many underdog wish-fulfilment buttons. It’s a tightly written story that both pastiches the mainstream Buffy and remains true to its weekly saving-the-world format. The fact that it’s not the first choice amongst its stable mates–it is the Xander Harris of Buffy eps–makes it even more resonant. My next one-off will be about a fantasy village of heroes called off to a war in a foreign land. Except, the players won’t be playing those heroes. They’ll be playing the people left behind. Children, the elderly or infirm, the village idiot, the coward who hid from the army recruiter… all of them strongly disadvantaged in some way that precludes a heroic role or any recognition for it. This is probably the easiest part to make happen. Children are short and weak, and the elderly are slow and often in pain. Simply shave off the hit points, strength and dexterity. More drastically shave off entire body parts from that farm machinery accident. I’m not sure I want to play this one. Mainly it’s because characters with severe mental impairments–to the point they can’t articulate ideas–will never be fun to play and worse, risk degenerating into caricature. There are milder mental problems, of course. Making a character unable to communicate verbally is something I’ve done in the past, with success–all I needed was to give them an ally in the form of another PC. Unisystem does have a whole list of “mental problems” which are designed to be playable and yet provide variety. Cowardice and Cruelty will probably work well, as will Paranoia. p>This is probably the most important side. The characters have started up as socially excluded already, albeit mostly patronised rather than disadvantaged. I’ve played games where children and adults mixed, and whilst the game was fantastic (based on Garth Nix‘ Sabriel) the issues came when the plucky children, who should have been going off on adventures despite the long-suffering captain’s orders to stay together and wait for the army, were sidelined in their activities by that authority figure (who was much more interested in building camp defences than investigating the weird-fu nearby). The experience here is that if I’m going to mix and match all ages then somehow I have to avoid division within the party on the basis of age. Some of the advice in Frax’s Group Generation article applies. However I expect to go through this exercise as GM rather than facilitating the player discussion (since this game is a one-off, there probably won’t be time). The system I’m leaning to is Unisystem, mainly because it works in one-off games–but also because it clearly identifies strengths and weaknesses of this type while retaining a strongly gamist orientation. Furthermore it deliberately provides tiers of competence (Buffy’s White hats and Champions, AFMBE’s Norms and Survivors).